Saturday morning, we woke up to a gloomy day. But you know that won’t stop us from going on adventures! Gettysburg is so cool. There are so many pubs and wineries within a half of mile walking distance! We stopped at the cute Ragged Edge Cafe, grabbed some coffee (and whatever carbs we could fuel up on) before heading to our first winery. There are four wineries that we went to that we could walk to – Knob Hall Winery, Hauser Estate Winery, Reid’s Winery Tasting Room and Cider House, and Adams County Winery. Knob Hall and Reid’s were definitely our favorite because of the awesome customer service and variety in dry reds. If you love ciders, I would suggest Hauser Estate and Reid’s! There’s a little something for everyone on a wine trip! 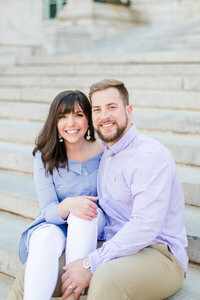 Sunday we headed to Liberty Mountain to enjoy some mimosas with the gorgeous Lindsay and Dan! After our session with them around the resort, we grabbed a bite to eat and then hit the slopes with them for rest of the day. I wish we could spend all day with every single one of our couples! Always a pizza slice. Never a french fry.